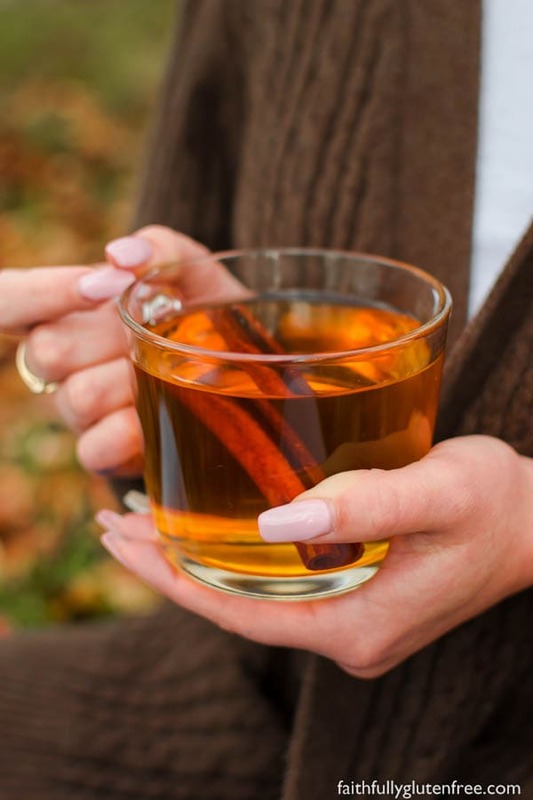 Just because you don’t press your own apples, doesn’t mean that you can’t enjoy a warm mug of cider – this Spiced Apple Cider is made from apple juice. Here’s a little piece of info you may not know about me, but years ago, I used to be a candle maker. The first Christmas after my husband and I were married, he bought me a candle making book, and I was hooked. I started pouring candles for myself. Then family. Then friends. And before I knew it, I had a full blown business with a candle shop in our basement. The house always smelled amazing. I sold my candles at craft shows and home parties, and once a year I would host an open house at our place. I’d transform our basement or dining room into a candle shop, with everything on display for those that wanted to do their shopping. In addition to the candles, I also offered my guests complimentary baked treats, cheese and crackers, and hot apple cider. 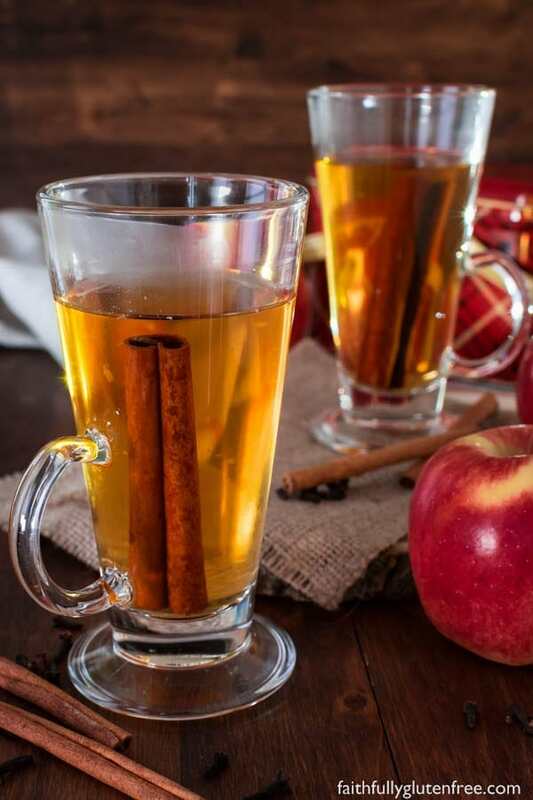 Although the days of candle open houses is long past, this cider is something we still enjoy when it’s cold outside. Let it simmer on the stove, or in the slow cooker, and fill the house with the amazing smells of apple, cinnamon, cloves and allspice. 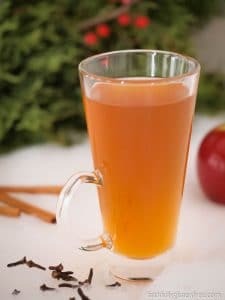 Sipping on a hot mug of Spiced Apple Cider is much better than being teased by the aroma of a candle burning. 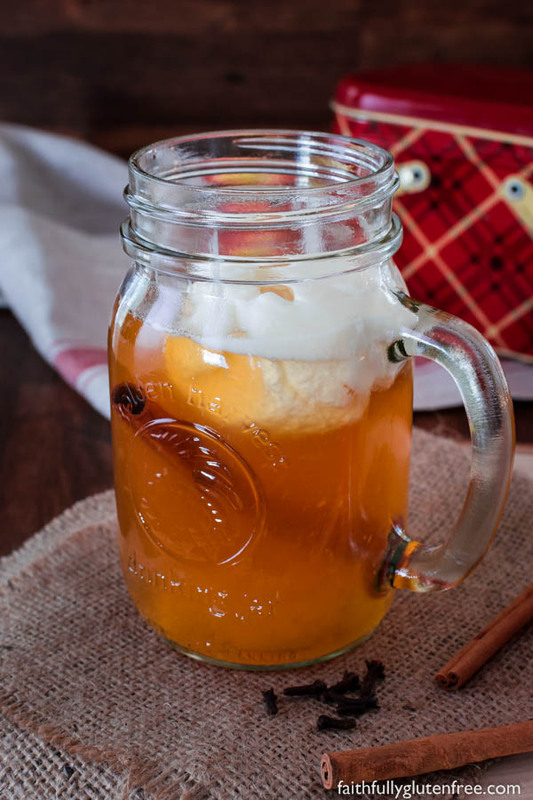 Add a scoop of gluten free Vanilla Ice Cream to your Spiced Hot Apple Cider. It tastes like a warm slice of apple pie. 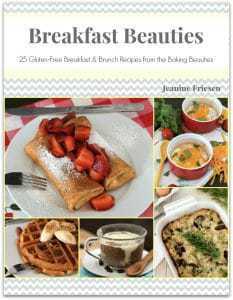 This recipe can be made on the stove top, or in the slow cooker. If you are making it in a slow cooker, heat on high for at least 1 hour. This recipe is easy to double or triple to serve a crowd. 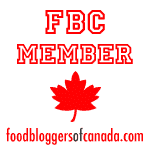 Place all the ingredients in a sauce pan, stirring until the sugar dissolves (if using). Heat the apple cider over medium heat, until it begins to simmer, then reduce the heat and continue to simmer for at least 30 minutes. The longer you simmer it, the stronger the flavour will be. Once it is spicy enough for your taste, remove the spices using a slotted spoon. Originally published December 2014. Images updated October 2018.